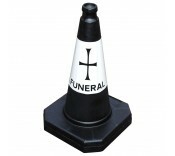 Road Traffic cones are brightly colored markers that are placed on roads or footpaths to safely redirect traffic on a temporary basis, to warn drivers not to drive too close to an area where work is being done, and that there has been an accident. They are also often used to separate or join lanes during construction projects, although heavier, more permanent markers or signs are more suitable if a diversion is to stay in place for a long period of time. 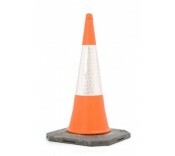 • Road cones - Bright red traffic cones that also have white reflective bands (to increase visibility). They are easy to move, yet include heavy duty bases, which reduce the chance of them being blown over. 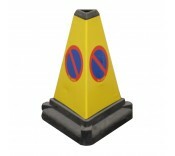 Road cone sizes range from 450mm to 1m. 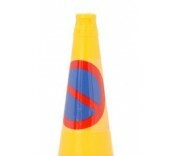 • No waiting cones - Triangular and cone-shaped cones indicating 'no waiting' for vehicles in order to maintain traffic flow. • Replacement cone sleeves – Retro-reflective sleeves for road and no waiting cones, that increase visibility from a cone when the original sleeve becomes worn. 'Danger overhead cables' sleeve and sleeve adhesive also available. • Traffic cylinders - Highly visible cylinders designed to redirect traffic. Bases, adhesive pads and fixing bolts for cylinders are also in this category. These cones can also be used to mark off secured areas which are closed to passersby, for various sporting activities, such as to improve dribbling by running between them in football and as distance markers for running, and to indicate dangerous environments and private areas.